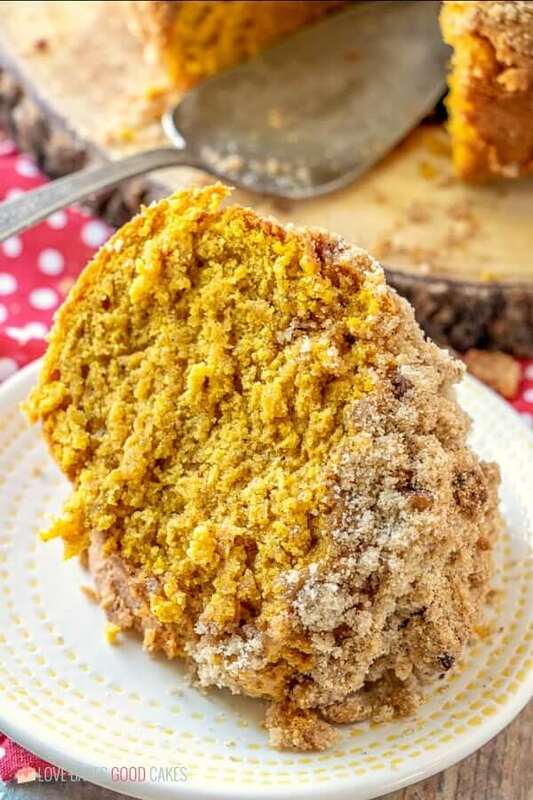 Make breakfast or brunch extra special when you serve this Pumpkin Streusel Coffee Cake! You don’t have to wait for fall – Pantry staples make this the perfect coffee cake for a year-round treat. Pumpkin is definitely, without a doubt, my favorite fall flavor. I look forward to it all year. 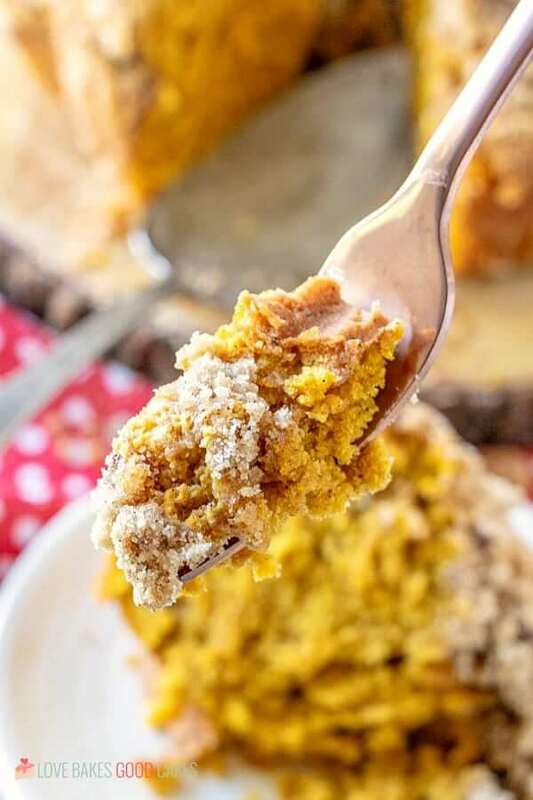 And if I’m perfectly honest, I enjoy pumpkin recipes all year long. There’s no shame in my game. 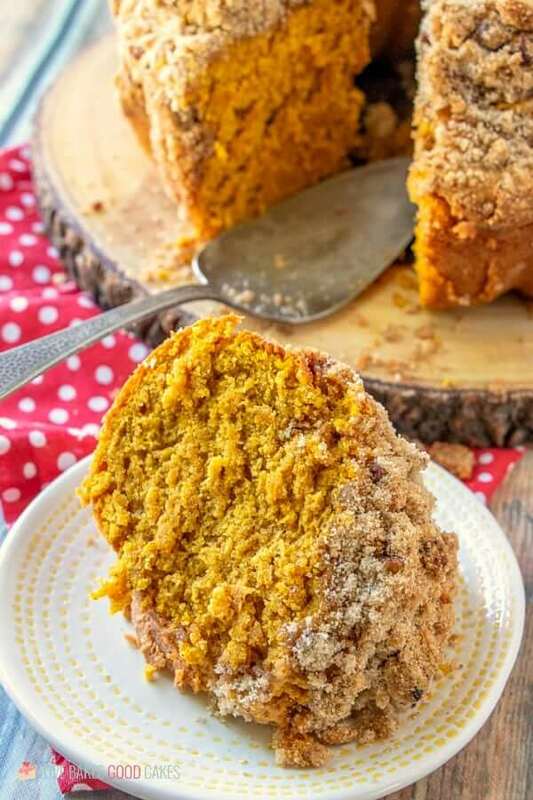 One of my favorite things about this Pumpkin Streusel Coffee Cake is not only can it make an appearance for breakfast or brunch, but it would be an equally delicious dessert idea. Heck, you might even want to eat it for lunch and dinner too. No judgment from me. I might even join ya! 😉 Cake is good anytime. Am I right or am I right? 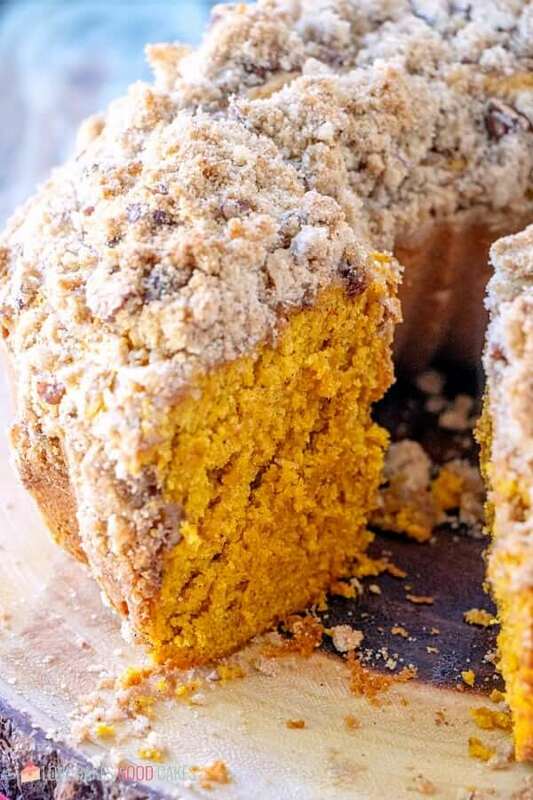 Since this Pumpkin Streusel Coffee Cake uses mostly pantry staples, it’s easy to whip this together any time. Although the recipe list may look intimidatingly long, you’ll see that it’s mostly ingredients you probably already have on hand. Which is great because you can make this any time! And trust me, you’ll want to make it all the time! It’s that good! 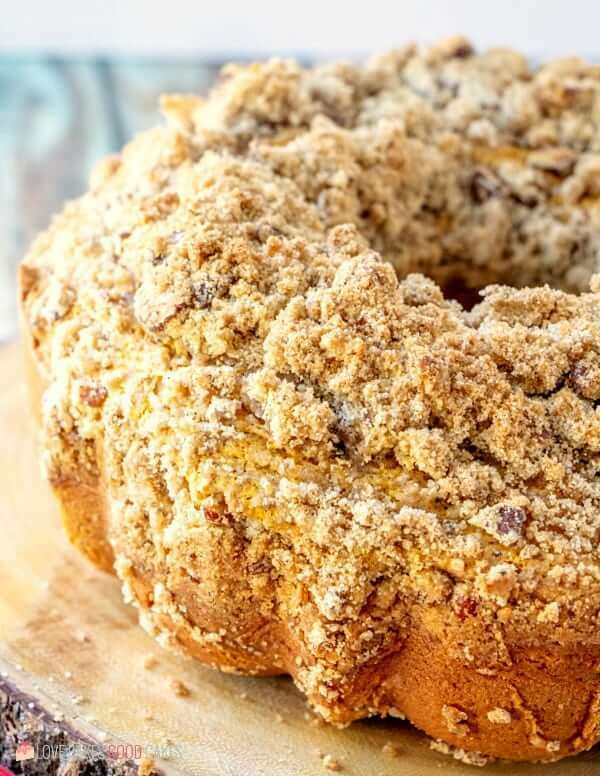 Make breakfast or brunch extra special when you serve this Pumpkin Streusel Coffee Cake! You don't have to wait for fall - Pantry staples make this the perfect coffee cake for a year-round treat. Preheat oven to 350°F. Grease and flour a 12-cup bundt pan and set aside. In a large mixing bowl, beat the butter and sugar until well blended. Add the pumpkin and eggs - mix until well combined. In a separate bowl, combine the flour, baking powder, cinnamon, ginger, nutmeg, salt, and cloves. Whisk until spices are evenly distributed throughout. Add the flour mixture to the pumpkin mixture. Mix with an electric mixer on medium speed for one minute. Stop the mixer and scrape down the sides of the bowl with a spatula. Continue to mix on medium speed for about two minutes or until the mixture is thoroughly combined. Evenly pour the batter into the prepared bundt pan. Use the back of a spoon or spatula to help level it out. In a small bowl, combine the streusel toppings - flour, both sugars, cinnamon, melted butter, and pecans. Evenly sprinkle the topping over the batter in the bundt pan. Bake for 50-55 minutes or until a toothpick inserted near the center tests clean. Cool on a wire rack for 15 minutes. Carefully loosen the cake with a knife. Invert the coffee cake onto a plate then invert it onto a serving plate or cake stand (the streusel side should end up being on top). Allow the coffee cake to cool completely. I wish I could have slice of this delicious looking cake! oh boy that sounds wonderful! Thank you so much for sharing this wonderful recipe on my blog hop! Pumpkin is my youngest sons favorite flavor. I think he really enjoys this time of year because of the pies and anything else that has pumpkin in it. I'm going to make your recipe soon. I'm sure it will be a big hit around our home. Thanks for sharing. Visiting you from Full Plate Thursday. 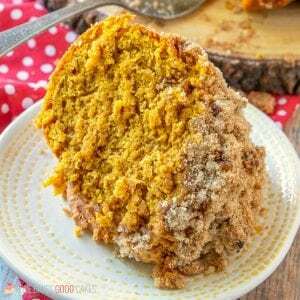 That looks fantastic and is the perfect (pumpkin) recipe to share at Foodie Friends Friday. Thank you for sharing. mmm, sounds delicious! Pumpkin and streusel. It would be hard to go wrong with this! I need to add this to my Can You Say Pumpkin Spice Board on Pinterest! THanks for sharing at Must Try Monday! Well, yum! This will get me out of my cinnamon pecan coffee cake rut. Thanks for linking! 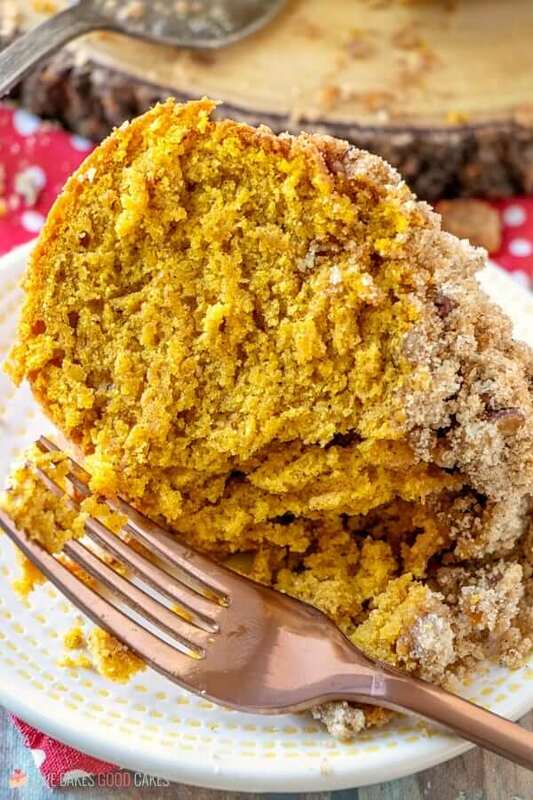 MMMM pumpkin spice…..I am drooling now LOL Thank you so very much for sharing this on Manic Monday. Pinned and Tweeted!! I love coffee cake! I need to try this out. Thanks for sharing at Iron Chef Mom this week! You are being featured on my blog tonight! Thanks so much for sharing your wonderful recipe with us! 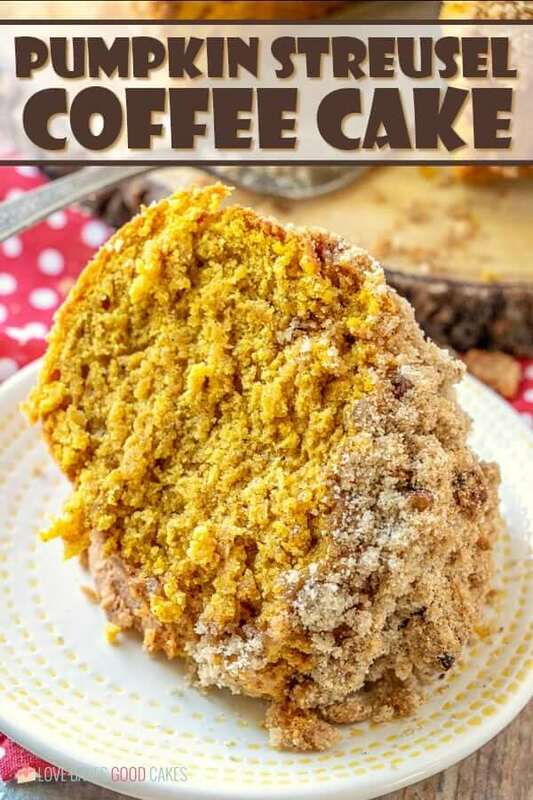 The recipe seems great and my hubby loves to eat coffee cakes, so I can try this out and make him happy. 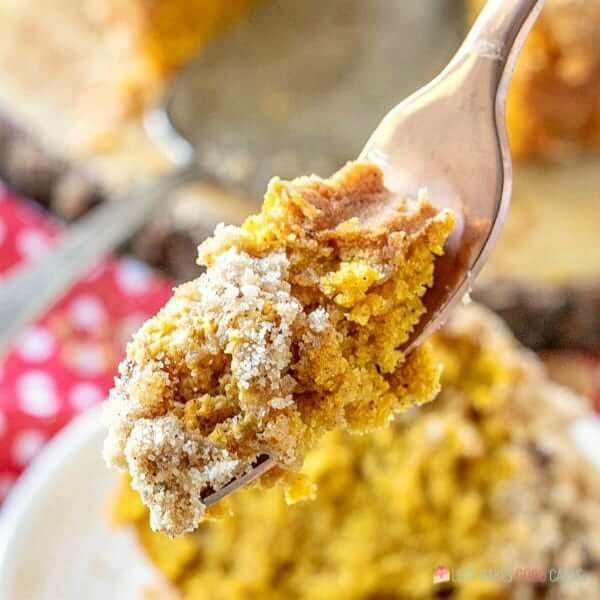 Since we love pumpkin, I make pumpkin pie all year! 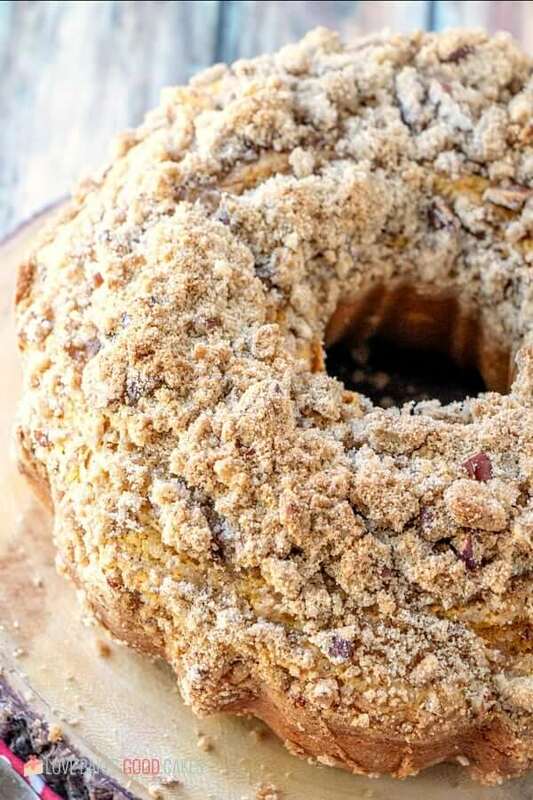 This coffee cake sounds really delicious! Will have to try! If you put the streusel on at the end, won’t it be on the bottom of cake when it’s flipped?? It looks great and I want it to look like yours.